Normal website hosting plans are shared by many users on a single computer. This means that one computer is being accessed by many websites at the same time on a single computer, or as referred to in the IT world, a single server. Thus, a normal hosting plan is furnished by a computer that is accessed by up to hundreds of different users at the same time. This shares the server’s bandwidth, memory and storage space. A dedicated server on the other hand, means that one user is leasing on an entire server computer that is totally configured the way you wanted to and your preferences are set up according to how you want it. However this dedicated server is physically in a data center and is rented to you by a company that’s leasing dedicated servers as a business. 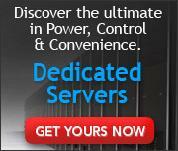 How is a Dedicated Server Used? A Dedicated Server is used for a large variety of purposes, however the most popular reasons why a dedicated server is rented is for websites that will have a high volume of Internet traffic. A dedicated server is also useful for database management. One program can be installed on a dedicated server and can be simultaneously accessed by many users. This makes for easy collaboration and file sharing among employees, admin staff, and the IT department. For example Microsoft Outlook installed on and the dedicated server can be separately accessed by as many users as configured in the remote computer configuration module each with their separate settings. A dedicated server has a high bandwidth, speed, and can have several server operating systems. These systems can include the Linux systems CentOS, Ubuntu, Fedora, or Windows 2008. Your dedicated server will come with full administrative access allowing you to install and run virtually any software on your server. This is excellent for database management, or to manage hundreds of websites on one computer that’s only dedicated for your purposes. Users Assigned to Dedicated Servers. Any server can have the amount of users allowed to access the computer limited from one user to as many as approximately 15,000. Users can connect to the remote computer by the remote desktop connection on your present computer using sign ig details provided after the server access has been configured.